Underwater Photo from Krabi Province, Thailand. 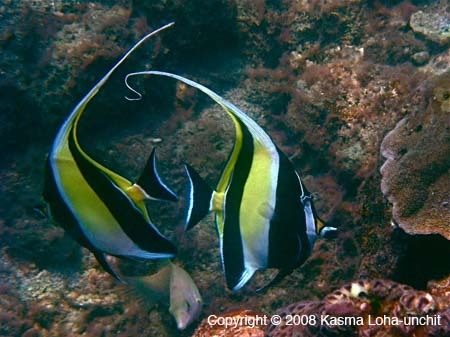 Pair of Moorish Idols: Moorish Idols are very common in the Krabi waters, such as this pair off Chicken Island. Note: All pictures in this sequence were taken by Kasma Loha-unchit in December 2008 and January 2009 in Krabi Province, Thailand. Most of them were taken in Phi Phi National Park with 8 taken at Koh Poda (Poda Island) and 3 at Koh Gai (Chicken Island). These are all sites that Kasma visits on two of her small-group trips to Thailand. You may also enjoy Kasma's other underwater photos.